Longyan Prefecture in western Fujian stretches for 19,000 square kilometers, accounting for 15.7 percent of Fujian@,@s total area, and has a population of 2.692 million. It is suitable for tourism throughout the year. Western Fujian has a long history. Some 4,000 years ago. people of the Yue tribe came to settle there. The prefecture was a well-known revolutioary base in western Fujian. As early as the 1930s, noted leaders of the Chinese Communist Party including Mao Zedong, Zhou Enlai, Liu Shaoqi, Zhu De, Chen Yi, Ye Jianying, and Deng Xiaoping all carried out revolutionary activities there. Western Fujian is one of China@,@s three principal forest regions, and it has various tree species and vegetation, boasting one fifth of Fujian@,@s standing timber and a tree cover of 63 percent. It is a natural limestone cave in Lonpkanq Village of Lonpvan City. The cave contains hills, and the hills inside have caves. Water flows in or over the caves. The zigzag Longkong Cave has a unique scenery and fresh air. The entrance is surrounded by bizarre rocks, and the top is covered with luxuriant trees and grass. Rising abruptly above the ground 1.5 kilometers east of Liancheng county seat, the mountain extends 20 kilometers in circumference. It is one of the top ten scenic areas in Fujian Province. There are many cliff inscriptions, towers, pavilions, and an academy of classical learning. The mountain looks like a lotus flower when viewed from a distance, hence, it is also called Lotus Flower Mountain. The exotic rocks there present unique scenes. Towering in southwestern Fujian, Meihua Mountain has an area of 225.7 square kilometers and a forest cover of 89 percent. It enjoys a comfortable climate and is green all the year round. The distinctively geological, geomorphological, vegetational, and climatic factors have given rise to the various natural tourist resources. The green peaks rise and fall to present a unique natural landscape. 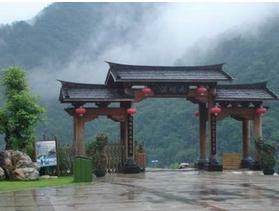 The Site of the Gutian Conference: The meeting place is in Beixi Village of Gutian Town, Shanghang County. Originally, it was a Liao-clan hall built in 1848 and renamed the Shuguang Primary School after the Fourth Front Army of the Chinese Workers@,@ and Peasants@,@ Red Army entered the village. This wooden and brick hall with a floor space of 826 square meters now houses 7,303 historical relics, the largest collection of revolutionary relics in Fujian. The city of Changting, the capital of the Hakkas, is a noted national historical city. The Tingjiang River, which originates in Changting, is one of the three major rivers in Fujian. It flows 285 kilometers to the south in the areas inhabited by the Hakkas in Fujian and Guangdong provinces before emptying into the South China Sea. The river water moistens the land on its banks and nurtures tens of thousands of the Hakkas. It is a unique residential structure in the mountain villages of Yongding County. The rammed-earth building is either square or circular in shape. The wooden-board gate, 20 to 30 centimeters thick, is reenforced on the exterior with iron sheet. The window in the wall facing outside is a passage of fresh air and sunlight or for shooting to check the enemy from entering the village. The house is fire-proof and can keep off wild animals. It is warm in winter but cool in summer. The better-known are the Zhencheng, Chengqi, and Yijing buildings.